Udupi, Feb 21, 2016: When polling for the Zilla Panchayat and Taluk Panchayat elections at a booth at Madibettu in Kananjar near Hiriadka almost ended on February 20, Saturday evening, there was a clash wherein a group of BJP workers reportedly attacked Congress workers. 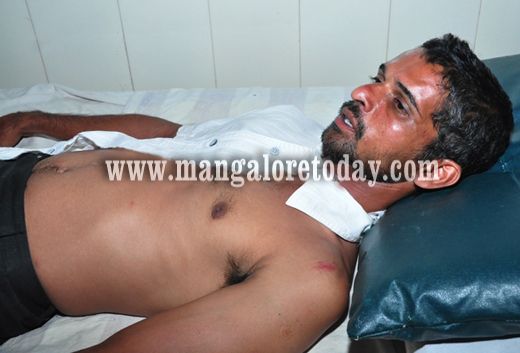 It is believed that the attackers intended to target Prasanna Hegde (37) who had recently quit the BJP to join the Congress after the BJP rejected his recommendation to field Vikram Hegde from Neerebailoor ZP constituency.It has been gathered that the BJP had fielded a Bhajrangdal activist named Sumith Shetty from Neerebailur following which Prasanna had quit the party. Prasanna, a former president of Neerebailur Kananjar Panchayat who was injured in Saturday’s attack has been hospitalised. He has alleged that the BJP workers who arrived by Bolero, Swift and Innova cars carrying lethal weapons attacked him and added he can identify some of the attackers as Krishnaraj Hegde, Prasad Shetty, Rajesh Shetty and Mahesh Shetty. It is said Prasanna and nearly 100 of his supporters had joined the Congress. Sources said around 15 BJP workers and 20 Congress workers were involved in the clashes. It is said the BJP workers went to the residence of a Congressman Sachidananda Prabhu who too had quit the BJP to join the Congress recently and threatened him. Hiriadka Police are investigating the case.